Get some work done Matt! Do you remember a restaurant called Mr. Steak? I feel like there was a Mr. Steak in Grand Forks and Fargo too. Status: offline Anyone remember Rax restaurants? They were like a high-class Arby's. I definitely remember one of those in Grand Forks. Anyone remember Rax restaurants? They were like a high-class Arby's. I definitely remember one of those in Grand Forks. Status: offline True story ,,, first time we went to Arbys I cried like a baby because I wasn't a big sandwich fan. IF we were going out to eat, I wanted a hamburger. Took awhile before I gave in and accepted that it was pretty damn good. Have to realize I was only 19 or 20 at the time. 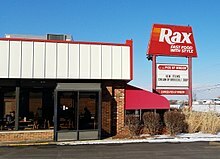 There are still 8 Rax restaurants in business. True story ,,, first time we went to Arbys I cried like a baby because I wasn't a big sandwich fan. I felt the same way about Arby's until I was about 25. I guess your taste buds matured more quickly than mine did. My Mom never let me live that down. To be honest I was about 10, but I behaved rather badly. Status: offline This has me dreaming about a road trip to Ohio just to find a Rax. We had to leave the San Diego Zoo after 15 minutes because I had a fit about my dad licking my dripping ice cream cone. I was very afraid of germs when I was 4. I still haven't lived that one down. So the reports of you Matt, in a Russian hotel room with prostitutes and golden showers is not true since you are a lifelong germaphobe. Status: offline Power grid went out in Vermillion. Status: offline is this where you got your info from yesterday Matt? is this where you got your info from yesterday Matt? Yes, that was one of several compilations I found. I'm gonna pat myself on the back for piquing your interest on the topic. And at one time, HoJos was the biggest in the nation? Wow! Status: offline Mr. Steak and Rax were "deep cuts" I found in the bowels of nostalgia-type internet message boards. Not sure why those didn't make any of the lists I found. There were a bunch of lists, but they were mostly just stealing the same info about the same exact restaurants. Someone must write those things up and sell them out all over the place. Quite a few that started in Minneapolis. Chi-Chi's for one. I remember the one in Grand Forks was super popular. Right by the Columbia Mall. I believe it is the current site of Texas Roadhouse. That area of Grand Forks has changed a lot since I was a kid. Menards was like out in the country. Columbia Mall was the end of town. Status: offline You know, I think Ground Round could almost make the "defunct" lists by now. Isn't the one in Grand Forks like the last one still operating? Or don't tell me that one closed too! The Ground Round in St. Cloud must have closed about 8 years ago. Status: offline Apparently there are approximately 20-30 Ground Rounds still in operation. You know, I think Ground Round could almost make the "defunct" lists by now. Isn't the one in Grand Forks like the last one still operating? Or don't tell me that one closed too! The Ground Round in St. Cloud must have closed about 8 years ago. Wild times back in the '80s at the one across from the MET and also at the one in St Cloud when my wife went to school there. GREAT food and flowing liquor. Status: offline A ground round opened in Waconia a couple of years ago. It is quite good. The one in Grand Forks....I got sick after eating there 20 years ago and said I wouldn't eat in a Ground Round again. One thing to check Matt, the number of Bonanza restaurants still in operation. There is one in Yankton. They used to be all over. A ground round opened in Waconia a couple of years ago. It is quite good. The Bonanza in Brainerd finally closed, maybe 3 years ago or so. I'll check it out. Status: offline Ponderosa and Bonanza are the same thing now. Some are called Ponderosa and some are called Bonanza, but there is no difference other than the name. According to Wikipedia, there are still 88 total Ponderosas or Bonanzas operating. Not sure on the breakdown. Probably more Bonanzas.